A sustainable city requires a balanced relationship with its neighboring rural areas. Moving toward a higher urban density while achieving a lower overall regional density will require transformation in both urban and rural areas. Food, fuel, and other human uses are important factors when considering rural land use. Housing and employment can be added in nodal developments close to prime agricultural soils and diverse forests. Our region is known for its diverse agricultural products, including grapes, wine, orchard crops, dairy products, beef, and organic vegetables. Most agricultural land should shift away from acre-hungry factory farm, feedlot-style beef, dairy, and corn production toward more intensively managed field crops for human consumption and grass-fed small-scale meat production. The goal should be to sustainably produce as many calories per acre as possible while increasing productivity and employment. Many historic farms and prime soils are underused. Undermaintained land and agricultural buildings can be restored and brought back into production. This will create new and revitalized spaces which can be utilized as workshops to create diverse products. Many of these farms can be updated for the 21st century by integrating permaculture design with highly diverse and resilient farm ecosystems. Diverse farm models can also be used to revitalize the rural economy by creating many more niches for humans within the landscape. As we shift from a high available energy service-based economy to a low-energy material economy, much of the energy currently gained through the use of fossil fuels will have to be replaced with labor-intensive human power. Systems should be created to link willing young farmers with land, to incubate rural land-based businesses, and to assist groups hoping to create cooperative farms and ecovillages. Well-managed forests can provide a wide array of products. Many area forests are lacking good management and as a result are less healthy, more crowded, and less diverse than they could be. Popular education for rural landowners and farmers can instill better management practices, and cooperatively owned portable saw mills and forestry tools can help them add value to wood from their land. Programs to increase land access, especially access to forested land, can link urban residents with land in the country. Agroforestry techniques can increase diversity in forests and produce an income from lumber, value-added wood products, fruits and nuts, edible natives and fungi, and medicinal products. Recreational uses such as hiking, biking, hunting, and fishing can help preserve rural land and important habitat. Riparian buffers along streams and rivers can reduce turbidity, reduce soil erosion, and integrate recreational uses. These buffers can also provide forest products, habitat, and wildlife corridors. Buffers of a minimum of one hundred feet are highly recommended for all creeks, but depending on soils and slopes, buffers could be much wider. Buffer strips can be managed by farmers and community projects. Steep slopes currently tilled annually should be converted to permanent cover such as nutteries and orchards, as well as coppice crops such as willow and poplar for biomass fuel. The basis of rural life should be conservation villages: ecovillages from 50 to 200 households in size. These villages should be located within a ten-minute walk of major transit stops and should be designed using the same principles as urban environments. Higher density rural deveopment will also mean more feasible car sharing. Rather than the suburban model of development — which has an extremely low density, energy-wasting housing, and high dependence on auto-based transportation — these new developments should be urban and walkable in character, they should feature energy-conserving naturally built housing, and residents should work on site as much as possible. By retrofitting and reusing existing buildings, their embodied energy will be preserved. The dark green of streams and wetland areas forms the backbone of the new landuse pattern. Nestled between the fingers of naturalized riparian corridors lies the productive landscape of forests, agroforestry plantings, grazing land and other farm fields. 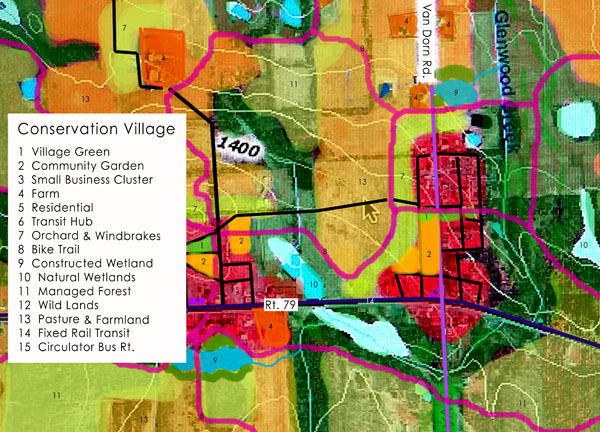 Farms are scattered throughout the landscape and, finally, villages are layed out along the dark purple fixed transit line and the light purple cirulator bus corridor. Pink pedestrian and bicycle trails connect the villages to each other and with the landscape. Applying compact nodal development patterns greatly contracts overall development and, thus, fuel and energy use. Again, nodal development should always be linked with fixed transit and should occur in existing major transit corridors. Compact development would include multi-family housing with live-work features. Natural building techniques, proper placement and orientation of new buildings, and culturally sensitive design will create timeless and efficient towns that will be more desirable to live in, while efficiently sheltering residents. Energy-sucking low-density housing can gradually be dismantled or integrated into new village centers; using Transfer of Development Rights, financial and lifestyle incentives, and taxation, county policy can shift residential land use into a much more environmentally sound pattern. Farm land can be freed up and many forests allowed to grow back, becoming a source for sustainable energy far into the future. 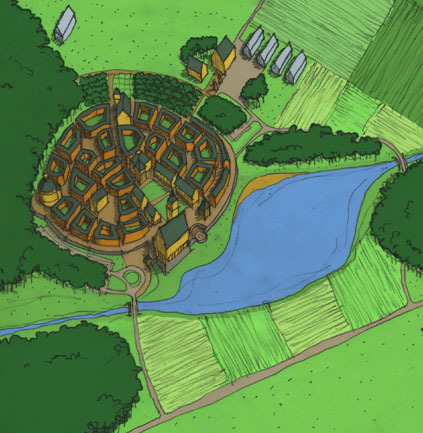 Here is an image of the Chrysalis Concordium (chrysalisconcordium.org), a car-free village concept from Rob Morache. Zonation, a common design consideration in permaculture, orients high-activity gardening and vegetable farming close to each of the conservation villages. Orchards and grazing are slightly farther away and forestry operations farther still, along with irrigation and aquaculture ponds. Land of high biological diversity and health surrounds the village, with some land remaining wild and used for wildlife and low-impact recreation. The Conservation Village assists in the preservation of both wild land and farm land, nestled in the midst of both. By putting the village back in the context of the country, residents are put in direct proximity of a productive landscape. This allows for a return to a material-based economy. Notice how the village integrates the existing built environment into its fabric and how solar aspect and landform play into village sites. Efficient water catchment and conservation will be a high priority. Protection of creeks, riparian habitat, slopes and sensitive environmental features, wildlife corridors, and greenbelts allows for a large increase in many under-recognized and underappreciated natural services such as climate control and erosion control as well as the well-being provided to humans by intact natural areas. Public access with bike and hiking paths can allow any resident easy access and potential fitness benefits. Ponds can catch and store water, and thus energy, high in the landscape. Through contouring and land-forming techniques such as keyline, water can be evenly distributed throughout the landscape. Pervious pavements and surface drainage within the conservation village will solve most conventional drainage problems and create beautiful water features within the residential area. Greywater can be treated on-site in constructed wetlands and living machines, then recycled in orchards and woody biomass plantings. Energy can be produced entirely on site with a surplus for export to the city. Active solar should be an element on each building. Higher elevations are best for wind turbines and for storing water. Developments that straddle rivers and streams can take advantage of small-scale electrical hydropower and mechanical hydropower for milling wood, grinding grain, and other uses. Biofuels have multiple uses on the farm and in the village, many of which could be extracted from long-lived and productive crops such as nut trees. Wood can be used efficiently in the home and can also be used in gasification to produce natural gas for cooking; the char by-product can be used as a soil amendment that traps carbon in the soil for centuries. Wood can also boil water to create steam in a boiler facility that is then distributed to heat the entire development; this is called district heating. Wire, water pipes, tools, and vehicles will all be used more efficiently in the compact development. The total energy savings resulting from better development will be substantial and come from many sectors. 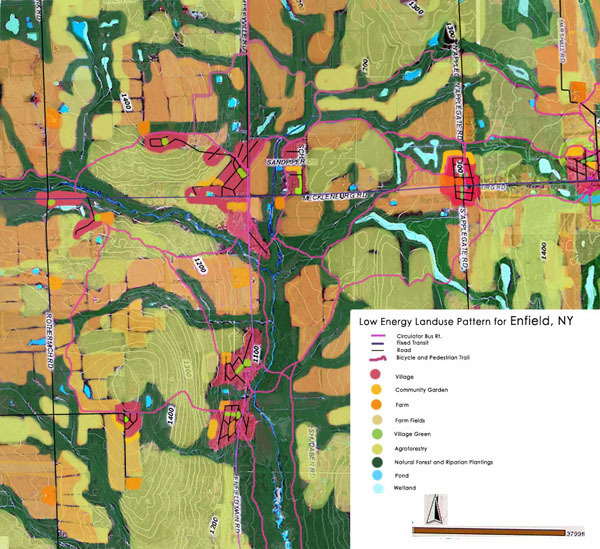 Each of the towns in Tompkins County would feature new nodal developments surrounding an enhanced, higher density town center. A transit connection in the town center would connect the rural population to downtown Ithaca and the University, College, downtown jobs, and downtown culture. The opportunity to develop a craft-based utilitarian economy would arise from villages' proximity to the land. Farmers' and crafters' markets in the centers will be the cornerstones of local life and generate significant tourism. Public-private partnerships can be created to establish not-for-profit business incubators, which will help to develop the physical infastructure of the village center and the village economy itself. As we face the challenges of climate change and peak oil, we would do well to remember that all changes are not necessarily bad. The potential to transform our society for the better is at hand. By working together, we can do our part to reduce American energy consumption. Fantastic work! I thoroughly enjoyed this series of 2 articles. Glad to see there are many kindred spirits working towards these goals. This page contains a single entry by Simon St.Laurent published on July 28, 2008 12:51 PM. Post-Peak Land Use Part 1: Ecocities was the previous entry in this blog. Preparedness Basics is the next entry in this blog.